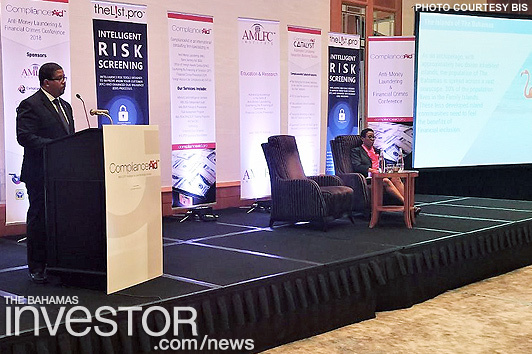 Deputy Prime Minister and Minister of Finance Peter Turnquest gave the keynote speech at ComplianceAid’s Fourth Caribbean Anti-Money Laundering & Financial Crimes Conference held in Miami April 19. It is indeed a pleasure to be here with you today at the ComplianceAid’s Fourth Caribbean Anti- Money Laundering & Financial Crimes Conference. I am delighted to address you on the topic of Financial Inclusion Objectives, Benefits and Challenges. How many people remember a time when money was stored in a jar that you buried in the backyard? Coming from societies that fashion ourselves modern, it sounds like a practice from our ancient past. For residents of Cat Island, a population center in The Bahamas’ southern region, access to cash deposits is no laughing matter. It has only been 10 years since Cat Island got its first commercial bank. One local business owner remembers his father’s practice of keeping money under the mattress. While the business owner uses the local bank to operate his gas station today, his father, when he was a farmer some 20 years ago, had to find creative ways to store his cash. Some on the island resorted to burying their cash in the backyard. It was not so long ago that Cat Island operated bankless, and the residents haven’t forgotten. After all, there are still a few other islands that have no local access to financial services. The essence of financial inclusion is access: access to useful and affordable financial products and services that meet the needs of individuals and businesses delivered in a responsible and sustainable way. Providing an update during the recent Caribbean Travel Marketplace in San Juan, Puerto Rico, Yasmine Mills-Strachan, director of sales for Comfort Suites Paradise Island, reported that the hotel fared especially well over the Christmas holidays. Minister of Transport and Local Government Frankie Campbell (pictured) has announced that the Bahamas Maritime Authority will hold its first Bi-Annual Maritime Week, May 6-11.